Celtic brooch features silver tone metal construction that is enhanced with spirals along with glass stones. 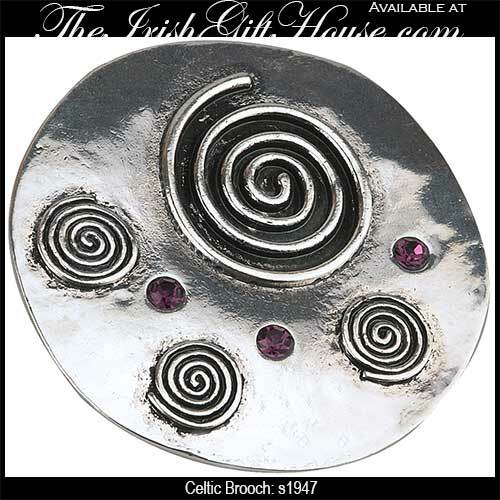 This silver tone Celtic brooch measures 2” round and features embossed spirals along with amethyst color glass stones. The chunky brooch is made by Solvar Jewelry in Dublin, Ireland and is gift boxed with a Celtic spiral history card, complements of The Irish Gift House. Celtic brooch is a gold tone metal design that features spirals and is accented with glass stones. A spiral is embossed on the plated silver tone metal disks of this Celtic necklace.